When dad’s in prison, his child is more likely to go to prison. Eighty-nine percent—that’s almost 9 out of 10 of Kentucky’s inmates—are male. Most of these inmates are fathers. We know most inmates aren't serving life sentences. Meaning, the father in prison is returning to his community and to his family at some point. Sadly, most inmates are released ill equipped to face the problems that put them in prison. The Kentucky Department of Corrections (DOC) is addressing this problem through fatherhood programs, and it’s working. The Kentucky DOC has used NFI’s fatherhood programs since 2012. We wrote about the progress of the DOC training 381 dads and counting. Now we’re excited to share some insightful statistics—beyond the progress in training dads—on how effective our programs are to inmates and the DOC both while inmates are in prison and upon release. We know our fatherhood programs work, but we get excited when others conduct their own research and learn how much impact our programs have. Prior to entering the program, participants averaged 1.836 disciplinary actions per inmate compared to only .32 actions per inmate while they participated in the program and .26 actions per inmate after they completed the program. This is a whopping 86 percent reduction in disciplinary actions. It’s vital to note that NFI’s programs help fathers in Kentucky’s DOC not only while in prison (using the InsideOut Dad® Program) but upon release (using the 24/7 Dad® Program). Research shows that fathers who learn to connect to their children and family before being released are more likely to successfully integrate back into the community and less likely to return to prison. While the statistics on recidivism and disciplinary actions are vital to understanding the widespread impact NFI’s programs can have on inmates and corrections systems, behind every statistic, as they say, is a person. To truly grasp the life-changing impact of NFI’s programs, it’s important to capture that impact in the words of the dads who participate in them. Here is one Kentucky inmate’s story. Please take a moment to reflect on his words. See what happens when a father goes to prison and is then shown the tools for how to connect with his child through NFI’s programs. I've always heard the old adage a carpenter is only as good as his tools. That's why I would like to thank you and your volunteers for giving me the opportunity to have experienced and to have graduated your IoD class (InsideOut Dad® Program). With so many dynamics I have facing me in having six children I have a large task ahead of me, but I have some of those tools I need to start building and mending those relationships I so long to have with my children and vice versa. First of all I will tell you a little about myself, because change has to start with me. I am 45 years old and have six children ranging from 27 to 8 years of age. 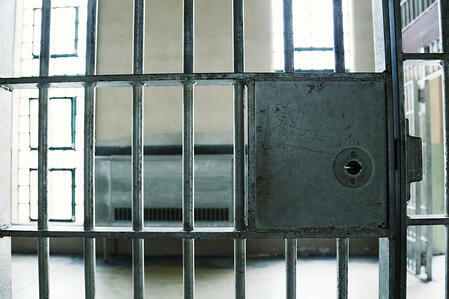 In 11 days I will serve out a 15-year sentence, but it is not the first time I have been incarcerated. Altogether, it will make 22 years I have served in sentences in the state of Kentucky which lets you know I haven't been in my children's lives very much over the years. Through God and this class I have actually started mending some of these relationships I have either destroyed or never gave a chance to develop in the first place. Since 1988 I've been in and out of jails and prisons only to stay out long enough to start a relationship and ultimately having children and then to leave them behind again. This time I served out my 15-year sentence and then seven years and four months with educational and other good time. I know I've done everything this time to turn my life around, but in order to do so I had to finally face my demons and look at myself for who I really was. If we don't know it's broke we tend not to fix the problem. All in all I've left a lot of damaged lives behind in my wake of destruction. With IoD (InsideOut Dad® Program) I've been able to salvage some of these relationships and prepare to face the challenges of starting a relationship with my children. The first tool I’ve learned to use is communication. I have six children by four different mothers which I'm not proud of, but ultimately it seems I had fallen into my father's footsteps (learned behavior), so in the seven years there's been no telephone calls because of the high cost to make telephone calls from prison. I wish I could start a fund just to help with that cost of future fathers could stay in touch with your children, especially the ones going through this program. Through writing I had mended my relationship with my oldest daughter Sheena. We have been corresponding on a regular basis for a while now. She followed my footsteps and committed a crime two years ago, but was put on a diversion program, which included six months of in-house rehabilitation. During our time of writing I've used several tools I've learned through IoD (InsideOut Dad® Program) such as getting to know who she is, her personality traits, so I would be able to have more to talk to her about. Of course I have apologized many times over the years that I was absent from her life. I knew she blamed me for the way her life had turned out so I used another tool (empathy). I put myself in her shoes and realized this was true because I too blame my parents as well for my life being messed up. Now we have something in common that we can share and build on. I let her know I can relate to her, because I had been on my own all of my life as well. I told her how I finally located my mother at the age of 15 years old and how it didn't go over so well. Ultimately I moved in with her and my step-father to pay $55 a week for my part-time job that I had that summer just to sleep on the couch. I moved out on my own after two months and it actually was cheaper for me that way. I also told her I had to stop blaming them, because as an adult I knew wrong from right now. I couldn't blame them for my mistakes any longer. Like her, my rough childhood resulted in drug use to numb the pain from the past. Now here's the miracle I want to share with the world. This is better than the fact I get to leave prison here in 11 days. After the fact she did six months rehab she decided she wasn't ready to leave so she signed up for another six months which I supported 100%. I told her that she needed to take this time to be there for herself and not worry about anyone else because she does have four children of her own which her mother has now. I told her I have learned by experience if you can't be there for yourself you can't be there for anyone else either. If you don't love yourself how can you expect anyone else to love you in return? This one time it was all right to be selfish, because it was for all the right reasons. This girl completed 14 months of rehab dad being your number one supporter and biggest fan. A recovery center in Kentucky has hired her on full-time as part of the staff now. She is in a good place now and loves her job. A month ago she sent me her phone number. The fact that I'm leaving here on the 31st gave me an opportunity to get an institutional phone call to see if she would be at the bus station when I'm dropped off that morning. By the way I will be spending the morning with her and my four grandchildren whom I've only met the oldest as of yet. This is the first conversation I've had with my daughter in over seven years. She answered and said hello and I said hi baby girl. She said who is this and I said it's your daddy. All she could do is cry. After she got her composure she finally said the words so longed to hear. I love you and I forgive you for not being there for all those years. She said through God she had so much peace that she was finally able to forgive me. In our conversations through writing God had been our main subject of discussion. The way I see it, whether you believe in Jesus or not, which I do, there are good morals to be learned from the Bible. Just as the tools I've gained from IoD. With these tools and the wisdom and patience of my instructor Mr. X, I've built relations with two of my children. Nikki my 21-year-old daughter is who I am moving in with on the 31st. She just had her first baby on the 18th of this month. She truly loved and forgives me as well. My 25-year-old daughter and whom I've only seen four times while incarcerated since her birth has expressed a need to know me as well, because she has talked to her siblings and has noticed a change in my life and relationships I've built with them. IoD (InsideOut Dad®) is contagious. My 19-year-old son doesn't respond, but I still send him letters, just to let him know I still love you. He may be a little angry, but in time even water dissolves the biggest and hardest of rocks. My children 10 and eight years of age don't know me, but they soon will. I have written them over the years so they do know I exist and that I put forth the effort. All in all I would like to think NFI for IoD (InsideOut Dad®) for the programs put forth to help us fathers and children. Like I told my oldest daughter Sheena it's up to us now to stop this vicious cycle that's been handed down to us from generation to generation. It's time to plant new seeds. Thank you for giving me the tools to do so. I don't know by putting my children needs before mine and getting to know them and giving them the chance to know me that we can turn things around. I believe now that I can turn things around. I believe now I can lead by example, to teach my children that they can live a morally ethic life by watching me to do it in love. I have for myself and them as well now. If I can't fix myself how can I even possibly think of fixing my relationship with them? Thank you for your time in the tools I needed to rebuild the relationships I so desire to have with my children. Your work and efforts have not been done in vain. This is only one inmates’ story. There are hundreds just like it in Kentucky alone. We at NFI are thankful for the leaders at the Kentucky DOC. We are so excited about their commitment to rehabilitating inmates through programs like InsideOut Dad® and 24/7 Dad® so that corrections is part of the solution rather than just another step in the criminal justice process. The state, the fathers, the families, and the children of Kentucky are seeing the benefits of this solution-based approach. For more information on the products and services the Kentucky DOC is using along with the organizations they are partnering with, view the full case study and visit our Corrections Programs page for more program successes.